Sork VL, Aitken S, Dyer RJ, Eckert AJ, Legendre P, Neale D. 2013. Putting the landscape into forest genomics: Approaches for understanding local adaptation and population responses to a changing climate. Tree Genetics & Genomes. 9, 901-911. The Forest ecosystem genomics Research: supporTing Transatlantic Cooperation project (FoResTTraC) sponsored a workshop in August 2010 to evaluate the potential for using a landscape genomics approach for studying plant adaptation to the environment and the potential of local populations for coping with changing climate. This paper summarizes our discussions and articulates a vision of how we believe forest trees offer an unparalleled opportunity to address fundamental biological questions, as well as the application of landscape genomic methods complement traditional forest genetic approaches to provide critical information needed for natural resource management. In this paper, we will cover four topics. 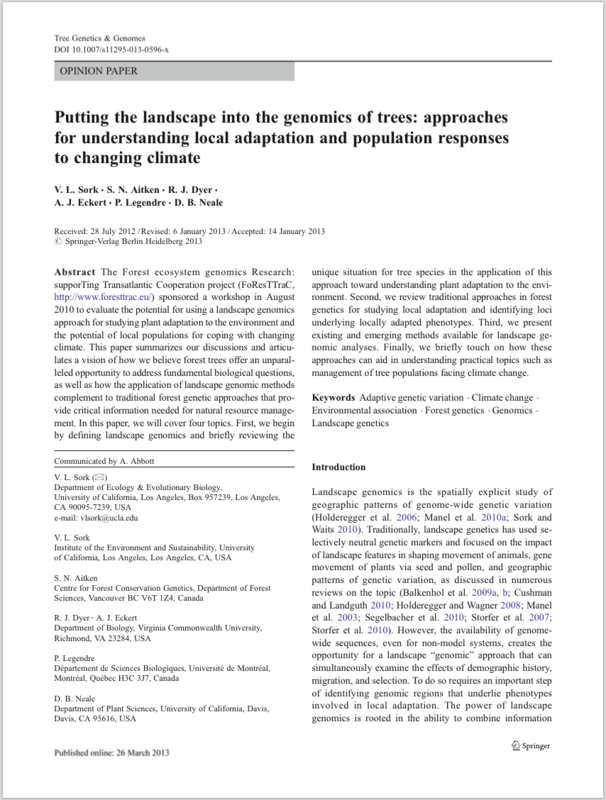 First, we begin by defining landscape genomics and briefly reviewing the unique situation for tree species in the application of this approach toward understanding plant adaptation to the environment. Second, we review traditional approaches in forest genetics for studying local adaptation and identifying loci underlying locally adapted phenotypes. Third, we present existing and emerging methods available for landscape genomic analyses. Finally, we briefly touch on how these approaches can aid in understanding practical topics such as management of tree populations facing climate change.